Upscale American regional cuisine with eclectic international influences in a casual and cozy atmosphere is the best way to describe Morgan's Tavern at The Middlebury Inn. While indulging in the beautiful natural landscape, visitors to Vermont can enjoy the benefits of locally sourced fresh food from dedicated small farmers, artisan cheese makers, and specialty meat suppliers. Acquiring the freshest ingredients from Vermont producers and purveyors through the Vermont Fresh Network Partnership, the Chef prides himself on the innovative culinary concoctions served at Morgan's Tavern. 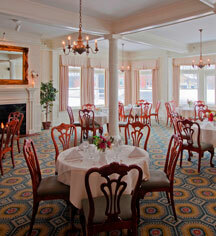 Enjoy the warmer months with local wine, beer, seasonal dining on the veranda overlooking the Town Green. 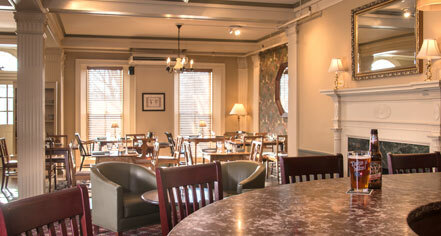 In addition to the fine beer and wine selections from around the world, The Middlebury Inn also features selections from vintners and brewers within a short drive of the Inn. Passionate about protecting and preserving the environment, Morgan’s Tavern takes great measures in composting and recycling all waste, using eco-friendly carry out containers, and closely monitoring how far the food is traveling. Being conscientious of greenhouse gas emissions, associates enjoy seasonal walks to the Middlebury Farmer's Market at the Middlebury Marbleworks to source some of the freshest ingredients possible.